A Florida jury took less than a day to find the City of Miami (“Miami” or the “City”) liable for multiple counts of antifraud violations of the federal securities laws. Additionally, the jury found Miami’s former Budget Director, Michael Boudreaux, liable for multiple counts of antifraud violations of the federal securities laws for his role in the city bond fraud that misled investors about the financial condition of the City in three separate offerings of municipal securities. 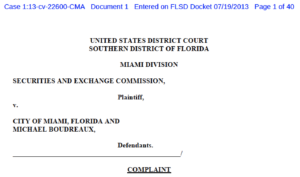 The SEC’s court Complaint alleged that Miami and Michael Boudreaux made materially false and misleading statements and omissions related to inter-fund transfers that were material to three 2009 bond offerings totaling $153.5 million. The Complaint further alleged that Miami and Boudreaux orchestrated the inclusion of this false information into multiple years of the City’s Comprehensive Annual Financial Reports (CAFRs). According to the SEC, those actions were material because the CAFRs were distributed to the public, including investors who had previously invested in debt issued by the City. Boudreaux also enabled the city bond fraud by making transfers of $37.5 million from the City’s Capital Improvement Fund to its General Fund to hide growing deficits in the City’s General Fund. Investors and bond rating agencies use the General Fund as a key indicator of a municipality’s financial health. Miami actively marketed bonds to the investing public while hiding the true reason for interfund transfers to boost the image of its primary operating fund … The fact that a city official would enable these false and misleading disclosures to investors merely a few years after Miami had been reprimanded by the SEC for similar misconduct makes this repeat behavior all the more appalling and unacceptable. We will hold accountable not only municipalities, but also individual municipal officials for fraudulent disclosures to investors. Miami cannot continue to play shell games with its finances. Investors and the markets deserve complete transparency in assessing the cityʼs municipal bond offerings. The trial lasted for 2½ weeks. When it was done, the jury took less than a day to reach its verdict finding the City of Miami and its former Budget Director liable for securities fraud. This was the first federal jury trial by the SEC against a municipality or one of its officers for violations of the federal securities laws. We will continue to hold municipalities and their officers accountable, including through trials, if they engage in financial fraud or other conduct that violates the federal securities laws.